The file of EC laid buried on my table for almost four years. At first I thought I wanted to write her story but then perhaps it was not necessary – let her secret go away with her, buried in her grave! But on 13 August 2012, a lady came to our centre for help. She too had breast cancer. And her story resembled EC’s case. This make me think again – I should write this story! Following further evaluation, EC was diagnosed with breast cancer. She subsequently underwent a biopsy leading to a right mastectomy with axillary clearance. At the same time she had a right breast reconstruction with latissimus dorsi flap and saline implant. The histology reported a Grade 3 ductal carcinoma measuring 2.5 x 2 x 1 cm. Three of 17 dissected lymph nodes showed metastatic disease. None of the 2 lymph nodes in level 2 showed metastatic disease. She tolerated chemotherapy fairly well with growth support using Granocyte. Although she is not diabetic on repeated measures, she unfortunately developed repeated episodes of skin infection following the last dose of Cyclophosphamide and Andriamycin. There was substantial celulitis over the implanted right breast. For that reason, EC is finding it difficult to proceed with further chemotherapy with the fear of recurrent flare of cellulitis. Since there is a fear of further exacerbation of her cellulitis with ongoing chemotherapy, Tamoxifen for 5 years was proceeded instead. As she has already achieved post menopausal status, there is no further recommendation for ovarian ablation at this stage. EC took Tamoxifen from 2003 to 2005. She received Zometa injection (for bone) ever six-monthly. Her progress was monitored regularly. 3 April 2004: Mammogram and ultrasound of her left breast and CT of thorax and abdomen showed everything in order. A bone scan on 5 April 2004 showed no specific evidence of bone metastasis. 21 March 2005: Mammographic findings are unchanged. On the four-quadrant ultrasound examination, there are two hypoechoic nodules demonstrated within the left breast. These are benign looking lesions. These ultrasound finds are already present in a previous examination dated 3 April 2004 and allowing for technical differences, are essentially unchanged. CT scan of the thorax does not reveal any mediastinal lymphadenopathy or pulmonary nodules. Two hypodense lesions demonstrated in the liver were also seen previously with no significant interval change in size or in character. These may represent small hepatic cysts. Bone scan showed no specific evidence of bone metastasis. (Note: Tamoxifen was stopped and changed to Arimidex in 2005 until 2008). 27 March 2006: No suspicious lesion is seen in the left breast. A small cyst is seen at 9 0’oclock position. The other cyst demonstrated previously is not seen today. Ultrasound of abdomen showed liver is normal in size and there are two small cysts present. These are likely to correspond to the hypodense lesions seen in previous CT scan done in March 2005. No solid mass seen. No pulmonary nodules demonstated. No hilar masses seen. No specific evidence of bone metastases. 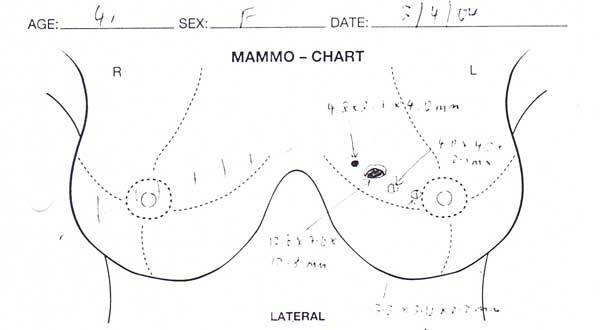 5 July 2007: No mammographic evidence of malignancy. Tiny left breast cyst. No focal solid mass lesion is visualised. Ultrasound of abdomen showed a 1.9 x 1.7 x 1.5 cm anechoic cyst in segment 7 of the liver. This appears to have shown slight interval increase in size. The previously noted subcentimetre cyst in segment 6 is no longer seen. No other abnormality is seen. 17 December 2007: Bone scan showed no specific evidence of any new bone metastases. Ultrasound of liver showed no sonographic evidence of hepatic metastases apart from a 1.9 x 1.8 x 1.6 cm anechoic cyst in segment 7 of the liver. 15 January 2008: Due to rising tumour markers, PET was ordered to assess for recurrent disease. The cancer had spread to her brain. EC underwent a craniotomy or brain surgery to remove the tumour. Her tumour was consistent with metastatic carcinoma, possibly breast. Oral drug Arimidex was abandoned and EC was given Aromasin instead. Zometa injection was continued as usual – every six-monthly. 11 February 2008: EC received 5 times of stereotactic radiotherapy to her brain. 17 July 2008: The cyst in her liver seemed to grow bigger. EC received another 5 times of stereotactic radiotherapy to her brain. 20 October 2008: Her brain surgery and 10 radiation treatment did not cure her brain cancer. The tumour recurred. 24 October 2008: EC and her husband came to Penang to seek our help. EC was prescribed Capsule A, Brain 1 and Brain Brain 2 teas and Breast M, C-tea plus Brain Leaf Tea. Unfortunately EC was not able to follow our therapy properly. We always tell patients – our herbal teas are smelly and taste awful. They have to be brewed and this could be a great chore indeed. And if you have undergone chemo and radiation, the chances are that you will suffer when you first start taking the herbs. Well, but that could not be as bad as the chemo or radiation side effects. Nevertheless, some people are less tolerant when they come to us. The reality is – they expect magic even if medical science has failed them. We did not get to meet EC and her husband again after their initial visit to us. They had decided to continue with more medical treatments. When nothing worked, EC decided to give up and turned to God for a miracle. She then died. EC and her husband told us that after the reconstruction surgery and chemotherapy, her breast became red, swollen and painful. I wondered what could have caused this. If you read the oncologist report above, an innocent-sounding terminology was used –cellulitis. What doesthis actually mean? The word cellulitis means inflammation of the cells. Specifically, cellulitis refers to an infection of the tissue just below the skin surface. The following are information from the internet when I searched for breast reconstruction and cellulitis,and breast implant infection. Cellulitis is an inflammatory reaction involving the skin and underlying subcutaneous tissue. Patients who undergo surgery for breast cancer, whether in the setting of breast conservation or mastectomy, are at risk of developing infection at the surgical site and in soft tissue. Surgical trauma predisposes patients to skin infection. Postoperative skin infections develop after 2%–7% of all surgical procedures. The incidence of surgical site infections is 12.4% following mastectomy with immediate implant reconstruction. After having breast implant surgery, about 30% of women will require further surgery within 10 years of their initial operation. Additional surgery may be needed as a result of complications such as capsular contracture (hardening of the scar capsule around the implant, see below), age-related changes to the breast or the shell of the implant rupturing (splitting). If you are having an implant fitted for breast reconstruction following a mastectomy (breast removal) you may have a greater risk of infection and bleeding. Why not solve one problem at a time? I am fully aware that for some ladies losing a breast is most traumatic. Many patients come to us with rotten breast and they still harbour the hope that I would say herbs can cure their breast cancer. When I suggested removal of their breast, they hesitated. To get the message across I said this: You choose – you life or your breast. In the 16 years dealing with cancer patients, I rarely come across patients who had breast reconstruction after a mastectomy. I also understand some ladies are very sensitive about their body image. They want their breast replaced immediately after losing one. One lady told us, she only agreed to undergo a mastectomy after her husband promised that she could go for a breast reconstruction. While writing this article, one lady came. She has just had a mastectomy. I asked her: How is it like – the mastectomy? She replied: I don’t know. I went in and when I came out I felt one breast was gone. Then I knew that it was cancerous. This lady just laughed after that! To her saving her life comes first. She and her surgeon had made an agreement that she would not want a needle biopsy but rather the tumour be removed and tested immediately. If it was found to be malignant, the surgeon would proceed with the mastectomy right away. I just wonder – why does someone want to rush into trying to fix problems all at once – immediately? Removal of the cancerous breast is not a cure. The cancer can recur. Would it not be sensible to wait until everything looks promising first before you move to the next problem of the missing breast? If there is a flare up of cellulitis as in the above case, are you not making your problem more complicated? Why not solve one problem at a time? This entry was posted in Breast Cancer, Failure Story and tagged brain metastasis, breast cancer, cellulitis, chemotherapy, mastectomy, reconstructive surgery by CA Care. Bookmark the permalink.